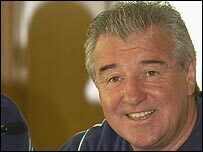 Terry Venables has admitted he would be interested in taking over as manager of the Republic of Ireland. The 62-year-old Venables has emerged as the favourite to succeed Brian Kerr but has yet to hold talks with the Football Association of Ireland. He said: "I've been offered quite a lot of positions. But if something came up that was special, like Ireland which is international, it may be interesting." A number of other high-profile names have been linked with the vacancy. The FAI has been on the lookout for a new manager since deciding not to renew Kerr's contract four weeks ago. Venables has the experience the FAI are looking for, having managed Spurs and Barcelona among others, although in the last four years his only time in football has been an ill-fated nine months with Leeds. Venables left Elland Road by mutual consent in March 2003, but managing the Republic could offer him the avenue back into the game he has been seeking.